Maro Guevara is communications director for CompassPoint Nonprofit Services. 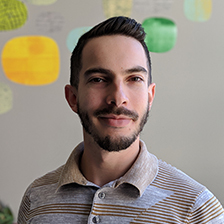 In his role, Maro leads the development of CompassPoint's overall communication strategy, thinks about ways to use communications to connect leaders with resources, and lifts up stories from team members and clients. In his previous role as project coordinator, Maro provided project support for CompassPoint’s leadership development programs, including Next Generation Leaders of Color and the Strong Field Project to End Domestic Violence. Maro has worked as a freelance copyeditor, copywriter, graphic designer, actor, producer, and social media manager. As a volunteer, he’s tutored with Reading Partners, worked as an online organizing intern for Tenants Together and served as a translator for the International Red Cross. He was associate producer for Climate Theatre during its residency at the Artaud building and as an actor he has appeared on stage with Aurora Theatre, Marin Shakespeare Company, Impact Theatre, Crowded Fire, and other Bay Area companies. Originally from Panama City, Panama Maro currently lives in San Francisco. "12 Resources for Your Self-Care Starter Kit"
"Six Valentines for Social Changemakers"